Jon Favreau’s The Jungle Book is that rare remake where its a thousand times better than the original film. The original 1967 Jungle Book film by Disney might be beloved my some just for being a film they watched during their childhood, but its a lazy and dull film, which Disney doesn’t necessarily do a whole lot with their original animated films. Favreau, coming off his brilliant 2014 indie Chef, directs the big budgeted remake for a whole new generation of audience members to enjoy, and I’m more than happy to report that Favreau’s Jungle Book is a new classic from Disney that the whole family will enjoy and cherish for years and years to come. 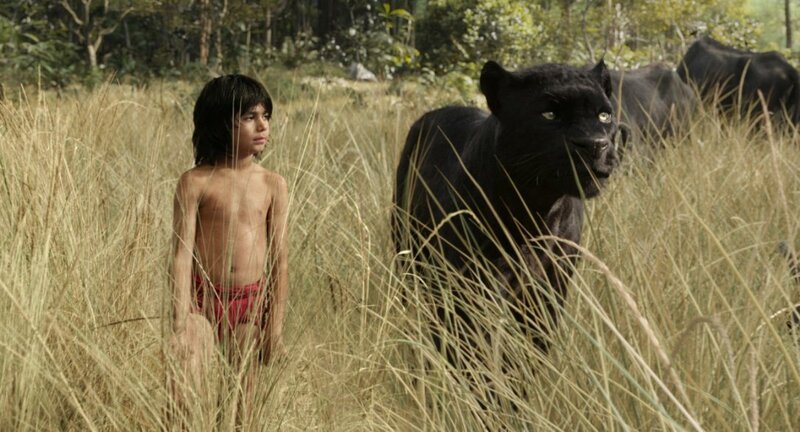 Young newcomer Neel Sethi plays Mowgli, the young protagonist of the film who was literally raised by wolves and other animals inside of the jungle. When Mowgli is threatened by the tiger Shere Khan (Idris Elba), Mowgli is forced to abandon his cub-mother (Lupita Nyong’o) and go back to live with his own kind. Throughout his journey into the jungle, he’s accompanied by a colorful cast of animated characters. Bagheera (Ben Kingsley), Baloo the bear (Bill Murray), and many other talented actors voicing the animals that inhabit the jungle. It’s also worth noting that the film features the late-great Garry Shandling in his final film performance as the porcupine Ikki. Shandling and Favreau had previously worked together on Iron Man 2 before this film. We miss you Garry, and thanks for all the years of laughter. As mentioned by every single film critic who’s praised this film, what’s easily the most jaw-dropping part of The Jungle Book is the sheer beauty of it all. The film is almost entirely computer generated, from the environments to the animals themselves, and you honestly have a hard time believing that all of it was created inside someone’s computer. It’s so photorealistic and just awe-inspring. To quote the “genius” film producer Rick McCallum (which popular YouTube film critics Red Letter Media have lampooned for years) the film is so dense, and there’s so much going on in every single frame of the film. And if you wanna get the best bang for your buck when you see the film, I highly recommend seeing this in IMAX 3D. This is the format that I was able to see the film in, and this is without a doubt the best way to see The Jungle Book in all of its visual glory. Let’s move on to the impressive voice cast that’s in the film. All the cast members listed above are fantastic in their roles, especially Bill Murray, whose perfectly cast as the hugable softy Baloo. Murray was absolutely perfect for that role, and I would’ve loved it if the entire film was just Baloo and Mowgli kicking back in the jungle being pals. We also get to see Scarlett Johansson in the role of Kaa, the hypnotic snake that attempts to eat Mowgli in the film. It’s a tiny role, but one worth mentioning since Johansson is perfect for the role. Speaking of Mowgli, the young actor that plays our hero is really spectacular. Sethi, who is only 12 years old as of writing this, is a spectacular find for Favreau, who spent months looking at thousands of unknown actors for this role before settling on Sethi. What’s equally impressive is that the young actor essentially acted by himself in a giant soundstage in downtown LA, with the animators creating the environment around him in post-production, with puppets being the only other “actor” Sethi worked with on set. Again, you never get the sense that Sethi was working in a cold and grey sound-stage while watching the film, as the CGI looks so real that you begin to suspect that the young actor is right there in the middle of the jungle. The Jungle Book easily has some of the best visual effects of the entire millennium, and I wouldn’t be shocked if the visual effects artists in charge of the film pick up a few Oscars next February. Cudos to Favreau, who didn’t over-extend the running-time of this film. The Jungle Book runs at a breezy 105 minutes long, which is the perfect length for a film like this one. There also really wasn’t anything that stood out as being bad or negatives with the film, maybe just because I was so mystified by the visual effects. I did however find a few nitpicks scattered throughout the film that took me out of the film for a bit. One in question was the sequence involving King Louis, king of the monkeys whose voiced by Christopher Walken in the film. Walken is great in the role, even if his screen-time is limited, but Favreau decides to show Louis’s massive collection of treasure by having Mowgli pick up a cowbell before we’re introduced to Louis (I’ll let you connect those two for a minute…). It took me out of the movie, and while it was funny for a chuckle or two, it was unnecessary. Jon Favreau’s The Jungle Book is not only a very exciting film, but one that can be very powerful and heartfelt at times. There were moments in the film were this critic might’ve gotten a little misty-eyed during certain key moments in the film. That being said, if you have kids and want to take them to a film that won’t make you want to bash your head into the seat in-front of you, The Jungle Book is the film that you should definitely do so with. While there are a few scary moments that might frighten younger kids, this is a film that will teach those kids life lessons about independence, growing up, and friendship. I can’t really think of any other family films in theaters right now that teach important life lessons like that, so I’d say this is pretty essential cinema to watch with the family. April 16, 2016 in 2016 Film Reviews, Movie Reviews.